The classic Paperboy game may be gone, but it certainly isn’t forgotten. Games such as Ragmeg Alleycat, a freeware retro title, bring back the fond memories of that game. 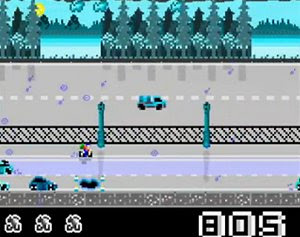 The player is a bike messenger who has to avoid the traffic, trying to escape the police cars and not to crash into civilian cars, pedestrians, poles, motorcycles and many more obstacles, all created in great pixel-art flavor. Along the way we’ll collect parcels, slide the bike, do some wheelies and other achievements to earn more points.